Motorists will have to wait for a green arrow sign before making a right turn at a vast majority of Singapore's 1,600 junctions, said the Land Transport Authority (LTA) yesterday, announcing a programme to nearly eliminate the use of discretionary right turns that some blamed for two recent fatal accidents. Responding to letters published in The Straits Times' Forum page and other media outlets questioning the safety of junctions with discretionary right turns, the authority said it has already introduced red-amber-green arrow lights at 200 junctions. The rest will be completed in five years. For junctions where it is not feasible to install the lights, LTA said it will look into other features to boost road safety. These will include turning pockets, lighted road studs, integrated pedestrian countdown timers, dashed pedestrian crossing lines and "Give Way to Pedestrians" signs. 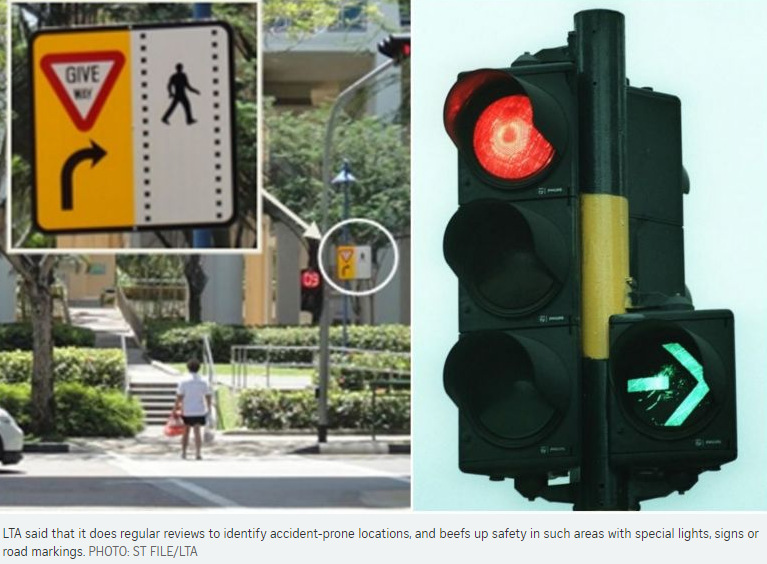 LTA added that it does regular reviews to identify accident-prone locations, and beefs up safety in such areas with special lights, signs or road markings. The announcement comes in the wake of two fatal traffic accidents in Clementi and Bukit Timah in the past week. In both cases, one vehicle involved made a discretionary right turn. The accidents sparked an online petition requesting the LTA to review whether it is still safe to allow drivers to use their own discretion to turn when the traffic light is green, "given the growth in sizes of junctions". The petition has garnered nearly 16,000 signatures so far. In a separate statement yesterday, the police said it had arrested a 54-year-old taxi driver involved in the Clementi accident and a 24-year-old woman involved in the Bukit Timah one. The police also reminded motorists to slow down and exercise extra caution when approaching junctions. "When making a right turn at a traffic junction, motorists must always give way to oncoming vehicles. They should not attempt to make the right turn if their views are obstructed," it said. The police said that it had received 36 reports of fatal accidents so far this year, which resulted in 38 deaths. One of the most recent occurred on Monday, when a lorry hit three pedestrians waiting at a traffic light. All three - a father, his daughter and their family friend - were pronounced dead at the scene. "Pedestrians will always be a vulnerable group of road users," the police said. "While motorists must always keep a lookout for pedestrians, pedestrians can also play their part in keeping our roads safe by staying alert and by looking out for vehicles even if they have the right of way." 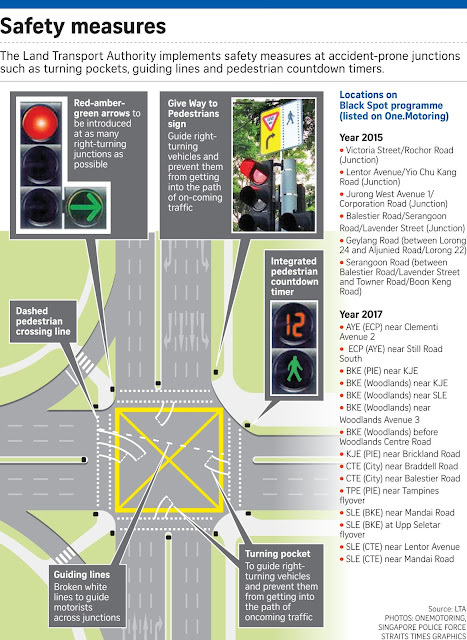 Installing red-amber-green arrow traffic lights at most intersections - which the Land Transport Authority (LTA) is aiming for by 2023 - would lead to better road safety, said industry experts, even as they stressed that it would not be feasible to do so at all 1,600 right-turning junctions here. "It's a compromise between safety and traffic flow; if safety comes first, then one has to accept delays," said Mr Gopinath Menon, who is a senior transport research consultant at Nanyang Technological University. "Right-turners will be delayed - our system has always allowed them to turn right on full green, provided they think it's safe to do so. Now it's gone, it means they have to stay back, they'll be held back." Mr Gerard Pereira, who is a training manager with the Singapore Safety Driving Centre, said that the authorities typically check on the volume of traffic at a junction. If traffic is heavy at a junction, the proposed changes could affect traffic leading to the area, causing more delays, he said, adding that one has to "see how junctions are mapped out". He called for more analytical studies to be done to ensure the most appropriate action would be implemented. Mr Menon added that having a blanket rule that all right-turn junctions must have the red-amber-green arrow lights is not necessary. He said: "It should be installed only where there are problems. It's not needed everywhere; it's quite safe at some places and if drivers exercise patience, there's no problem." 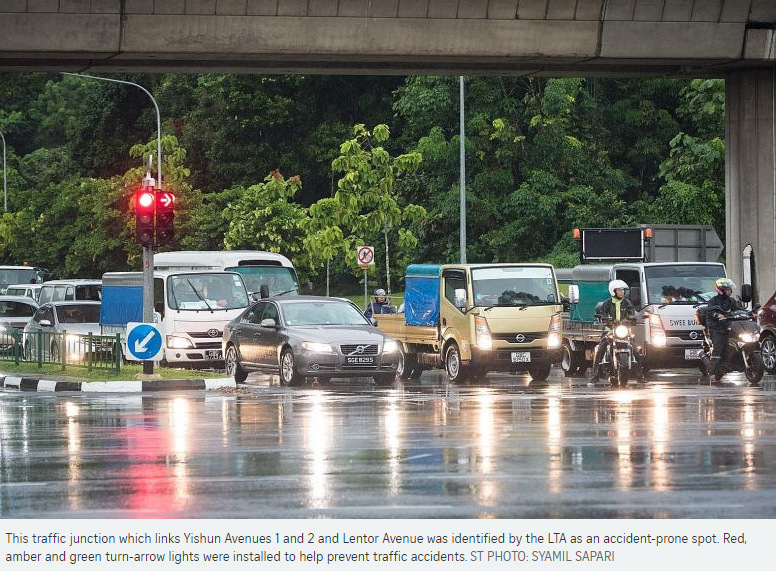 The LTA's statement on installing red-amber-green arrow lights at as many right-turning junctions as possible came in the wake of two fatal accidents at such junctions in the past week. The accidents led to an online petition calling for the LTA to review its rules. The petition has garnered nearly 16,000 signatures so far and its creator, who declined to be named, said that she was glad to hear of the LTA plan. "When I first looked at the two accidents, I saw the similarity was that the junctions were really huge," said the marketing manager in her 40s. "It makes it difficult for the driver to exercise good judgment when turning." In 2015, the LTA identified six accident-prone junctions, and another 15 were pinpointed last year. The LTA implemented additional safety measures at all the locations, such as installing special lights, signs and road markings. The issue of shared green time does not just affect motorists. Last year, at least two pedestrians, who had the right of way, were hit by cars whose drivers failed to see them. On July 28, a driver in a Mercedes-Benz car knocked down a young woman at a crossing in North Buona Vista Road. On Aug 26, retiree Sunny Yeo, 72, was pushing his 89-year-old mother Violet Tan on a wheelchair across Punggol East Road when a car hit Madam Tan and ran over Mr Yeo's foot. Madam Tan was hospitalised at Tan Tock Seng Hospital, but died three weeks later. To minimise accidents at such junctions, LTA said that it paints turning pockets to remind motorists to pause and look out for pedestrians. The Traffic Police also regularly monitor such roads to see if other enhancements are required. But they added that both motorists and pedestrians must do their part to ensure their own safety on the road. In countries such as the United States, it is not uncommon to see a split-phase traffic timing system, which assigns the right of way sequentially to both vehicles and pedestrians. Statistics also show that there is a larger decline in pedestrian incidents as well as multi-vehicle crashes when green time is not shared. Previous moves to remove discretionary right turns at accident-prone junctions have yielded results, according to data from the Land Transport Authority's (LTA) Black Spot programme. In at least two examples from the programme that aims to introduce engineering measures to improve road safety, the number of accidents more than halved at junctions where drivers had to wait for a green arrow to turn right. 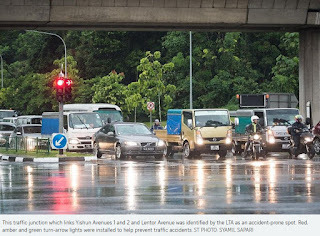 For instance, over the three years that LTA monitored the junction of Thomson Road and Moulmein Road, the number of accidents dropped from 19 to seven following the introduction of red, amber and green turn-arrow lights. Similarly, at the junction of Bedok Reservoir Road and Tampines Avenue 1, the number of accidents fell from 20 to eight. LTA declined to offer more details on its road safety measures at both junctions, including the specific period the accident statistics were recorded. Nevertheless, those who used the affected junctions said they were pleased with the changes. In Thomson Road, security officer Eddy Muhsin, who works in the area, said he has seen a sharp drop in accidents even if some drivers still try and beat the lights. "It's ultimately about drivers' attitudes," said the 60-year-old. But motorists also said the changes have increased congestion. At the Tampines junction, a 59-year-old driver, who wanted to be known only as Mr Goh, said: "It's safer but the duration for turning is too short. Now, only a few cars can turn before the light turns red again. It turns red very quickly, so cars rush even when it's amber." Junctions with discretionary turns were in the spotlight following two recent fatal accidents at such intersections. LTA said on Thursday that within the next five years, the "vast majority" of Singapore's 1,600 traffic junctions will have red, amber and green turn-arrow lights. Features such as lighted road studs and integrated pedestrian countdown timers will be considered at junctions where such lights cannot be implemented, said the LTA. Red-amber-green turn-arrow lights are already in place at 200 junctions here. The announcement was welcomed by drivers yesterday, even if some were worried that having two types of junctions to negotiate as the new lights are installed could be confusing. "Making it consistent (across Singapore) will be better for drivers," said artist Shah Ismail, 36. Experts, however, were a little more cautious about the effort to virtually eliminate discretionary right turns here. Dr Park Byung Joon, an urban transport expert with the Singapore University of Social Sciences, noted that it could be costly and difficult to implement islandwide as each new light will also need to be connected to the computerised system that controls traffic lights. National Safety Council of Singapore deputy president Fong Kim Choy stressed that while infrastructure can help, drivers have the most important part to play when it comes to road safety. "The safety culture is still not there," he said. "The (turn-arrow) light could be red, but if I choose to drive anyway, I could still cause an accident." The number of "black spots", or accident-prone areas, has gone down from about 100 four years ago to 48 now, according to the Land Transport Authority (LTA). No figures are available for how many accidents have occurred at these 48 locations, which include Lentor Avenue and the Woodlands Checkpoint. However, the LTA started its black spot programme in 2005 to identify locations with a high incidence of traffic accidents and implement measures to reduce the frequency and severity of such accidents. Five to 10 locations are removed from the list annually. Similar programmes in other countries such as Britain, Australia and New Zealand have also been successful. A study of one black spot programme in Western Australia between 2000 and 2003 found that it had reduced crash numbers by 15 per cent. The LTA uses software to identify black spots. Accident patterns are then analysed by accident type, location and the type of road users involved. Measures to improve the safety of these roads are customised for accident-prone sites following an investigation of the location. Besides the introduction of red-green-amber turning lights, other measures include the painting of speed limits on the road, as well as the narrowing of lanes and introduction of speed-regulating strips. While these measures could result in "less efficient" movement of traffic, this is a small price to pay, said Singapore University of Social Sciences Associate Professor Park Byung Joon. "There is no middle ground when it comes to safety," said the urban transport expert. A list of all 48 black spots can be viewed on the LTA's OneMotoring website. Whenever horrific accidents happen, people will often blame The System. Take the fatal collisions which took place at road junctions in Clementi and Bukit Timah this past week. It is the fault of The System, netizens opine. In this case, The System of allowing motorists to make "discretionary right turns". That is, there is no dedicated traffic turn signal, and drivers can make the turn when it is safe to do so. In the wake of the two accidents, which claimed two lives, there was an online petition for the Land Transport Authority to review discretionary right turns. The LTA announced on Thursday that it will set up turn signals at most junctions within the next five years. Currently, 200 out of 1,600 junctions here have turn-right signals. But in blaming The System, we run the danger of absolving humans of the one thing we are supposed to do better than machines - make judgments. True, some people make poor judgments, such as using their mobile devices while driving, driving when intoxicated, or not belting up. But I would like to think that most of us are pretty good at making sound judgments most of the time, especially when not doing so could result in loss of life, limb or licence. In assigning this responsibility to a set of lights, we are admitting that these lights are better than us. These turn-right signals are not going to guarantee safety. The Traffic Police will tell you that one of the most common road violations they see is people running red lights. Various cities in the West have removed traffic lights and traffic signs. This "shared space" concept passes the responsibility of safety to road users themselves, and promotes graciousness. And the results have been promising. With turn signals, we must brace ourselves for a drop in traffic flow efficiency. When you have traffic lights, the best efficiency you can hope for is 50 per cent. Often, it is lower if you factor in delays, including those caused by people who are on their phones at the lights. So, if most of the 1,600 junctions here have turn-right signals, there is going to be a noticeable drop in efficiency across the island. In short, expect slower traffic all round. One can argue that this is worth it if it saves lives. But so will banning driving altogether. If there are no cars, there will not be any road accidents. It sounds flippant, but it is logic taken to the extreme. And we face the risk of taking a step closer to this extremity, if we do not pause to ask ourselves if the accidents that take place are the fault of The System or road users. I must admit that I too signed the petition. Because like many readers, I was extremely saddened by the deaths of 19-year-old Kathy Ong and 23-year-old Jasmine Lim. So, when I saw the petition on Facebook, I reacted instinctively. But on reflection, I am not sure it was a systemic fault we are dealing with. LTA has identified only 21 accident-prone junctions here. That is merely 1.5 per cent of junctions which allow discretionary right turns. If it was a systemic fault, the figure would have been higher. That is not to say The System cannot be better. Clearly, having both signalised and discretionary turning at different locations is riskier because it confuses motorists, especially when they are not familiar with an area. It is better to have uniformity across all junctions. Junctions can be made safer if visibility is improved. They should be clear of trees and shrubs. The location of street furniture and infrastructure such as pillars and pylons should not block the line of sight. You do not need to be a traffic engineer to know that. Vehicles and pedestrians sharing the same green time at a junction can also be problematic. For instance, this is the case for vehicles in Punggol Central and pedestrians on Punggol East Road, and drivers are expected to give way to pedestrians who are crossing. But one day last August, a driver in a Toyota did not and collided with a pedestrian on a wheelchair, who died in hospital later. Certainly, technology can be harnessed to make roads safer. For instance, instead of installing turn-right signals - which are inefficient and so un-Smart City - LTA could install flashing light alerts to warn motorists of oncoming vehicles or pedestrians in the way. Such camera-based technology would be similar to blindspot alerts found in most new cars now, and would conceivably cost no more than a set of turn-right signal lights. Finally, it must be noted that road behaviour is usually the main cause of accidents. It is clear the tragic accidents in Clementi and Bukit Timah could have been averted if drivers going straight had been travelling slower or been a bit more alert. Motorists here have the bad habit of dashing through junctions, fearing they would be caught when the lights turn red. Blame it on a sense of entitlement if you like, but they also feel that if the lights are in their favour, they have an absolute right of way - all other road users be damned. It is as if they care more about being right than being safe. This is a poor attitude. Motorists should ease off the throttle as they approach a junction and be extra alert. If this graciousness can be inculcated in all motorists, the roads here will be safer. In many cases, it is not discretion that kills. It is indiscretion. It is lamentable that there are close to 800 cases of passengers and drivers caught by the authorities every month for failing to belt up in their vehicles. Needless to add, many others possibly go unnoticed because it is impossible to check every car every kilometre every day. The statistics are all the more surprising as they suggest that the dangerous habit of a driver or passenger riding unbuckled, and dire and often deadly consequences associated with road accidents, apparently does not feature prominently on the mental map of many Singaporeans - the existence of laws, and the threat of fines for non-compliance notwithstanding. A habitual disregard or inability to put on a seat belt could be put down to a lack of awareness and knowledge of how important these devices could be in the event of an accident. This is surprising since educated Singaporeans could be expected to understand the severe consequences of their omission. Nowhere is that importance better underlined than by the actions of civil defence officers, police and doctors who have the thankless task of trying to salvage victims from the results of their own folly, or the rash actions of others who are on the road. In similar accident situations, drivers and passengers tend to have more severe and varied injuries when not wearing seat belts. In head-on and other collisions, those not wearing a restraint tend to be thrown about in the car; indeed, they can become projectiles. Passengers in back seats of cars - the ones who tend not to belt up most, are ironically, the most vulnerable to injury. Lives are literally broken, all because a simple precaution was not taken in the first place. Clicking a seat belt into place takes but a moment of self-discipline; not doing so can destroy a lifetime. The dimensions of that choice are universal. According to Youth for Road Safety (YOURS), a United Nations initiative, more young people aged between 15 and 29 die from road crashes than from HIV/Aids, malaria, tuberculosis or homicide. In that context, YOURS draws attention to the protective role of seat belts, noting that "the simple action of belting up has saved more lives than any other road safety intervention in history". Along with airbags for front-seat passengers, belts for both them and back-seat travellers must be a social norm, as it is in countries such as Australia. In Singapore, some parents insist that they will not start to drive unless everyone has buckled up safely. That culture of safety above all - a part of the general respect for traffic rules - must spread to those who use taxis or private-hire cars. There should not be a need for the sanction of a fine to remind passengers that their chances of emerging relatively unscathed from a crash depends on a belt. The logic could not be simpler.